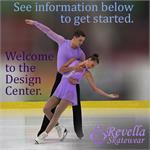 Welcome to the Design Center! To get started on having a custom garment designed for you, please read the information contained below. If you have additional questions, please feel free to contact us. The fee for this item allows you to receive up to five designs per garment. This item must be purchase each time you have a new garment to be designed, or if your design quantities exceed five per garment.